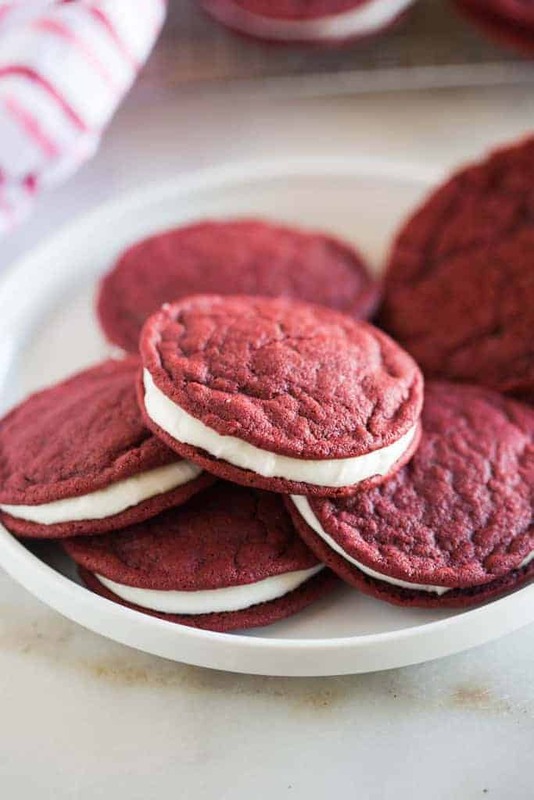 We’ve all gone a little crazy for these chewy Red Velvet Cookies with cream cheese filling. 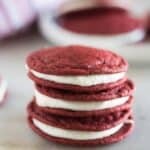 There’s something about that delicious red velvet flavor, with hints of vanilla and undertones of chocolate, mixed with the flavors from the filling that have me falling hard for these cookies! They remind me a lot of my favorite Homemade Oreo Cookies. They’re chewy, but pretty thin, so that you’re not overwhelmed when you sandwich two cookies together. Start with making the cookie dough. I use liquid red food coloring to get that great red color. 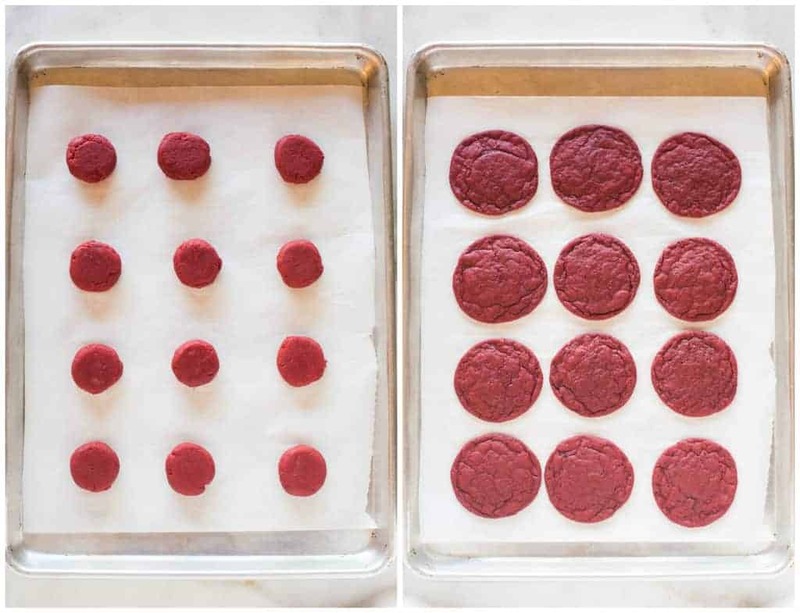 The dough has two tablespoons of unsweetened cocoa powder in it, so that you get the undertones of chocolate that everyone loves in red velvet cookies, but it’s not overwhelming. Use the palm of your hand or the back of a measuring spoon to gently press down on the tops of the cookies to flatten them slightly. Now they’re ready to bake! Be careful not to over-bake them, or you’ll end up with crunchy cookies. You just want the edges to be just set when you take the cookies out of the oven. They will continue to cook on the hot cookie sheet, out of the oven. Spoon some cream cheese frosting onto the bottom of one of the cookies. I do a pretty small scoop of frosting so the cookies aren’t too rich. Add another cookie on top to make a cookie sandwich. Cover and refrigerate the cookies until ready to eat. These cookies also freeze really well! Place them in an airtight container and freeze for up to 3 months. 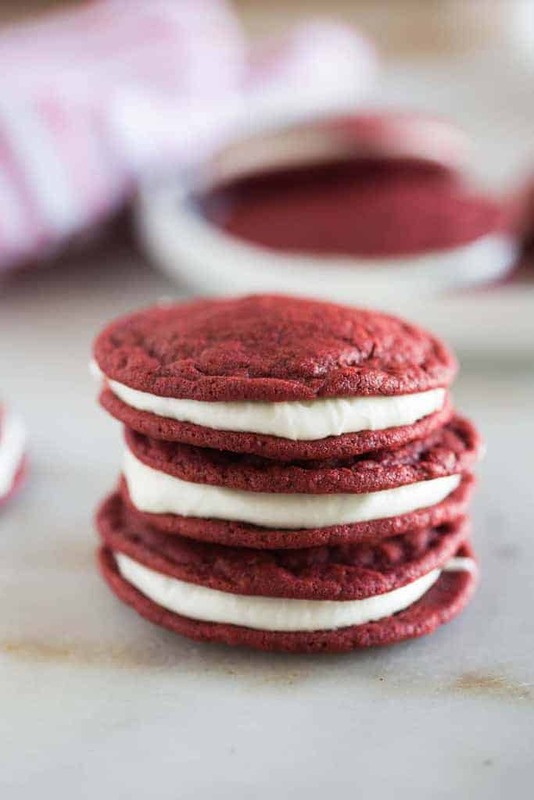 We LOVE these delicious red velvet cookies with cream cheese filling. A chewy cookies with hints of chocolate and vanilla, sandwiched with cream cheese frosting in the center. Whisk together the flour, cocoa powder, baking soda, baking powder and salt. In a separate mixing bowl, beat together the butter and sugar until light and fluffy. Add the egg and red food coloring and mix to combine. Add the dry ingredients and mix on low speed, just until combined. 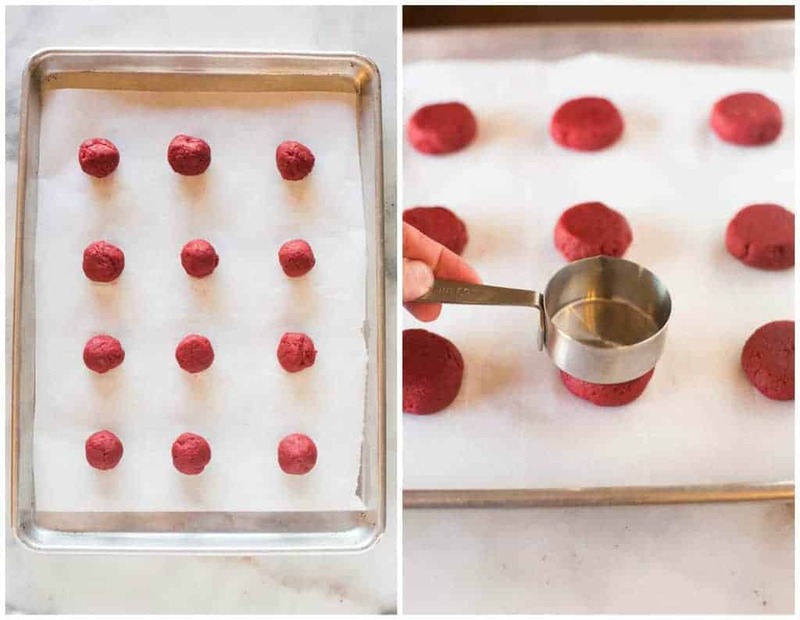 Use a tablespoon measurer to scoop the dough and then roll into balls (should make 24 cookies). Line the dough balls on the prepared baking sheets. Use a measuring cup or the palm of your hand to gently flatten the balls just slightly. Bake until edges start setting, about 8-9 minutes. Cool for 10 minutes on baking sheet before transferring to a wire rack to cool completely. Add powdered sugar and vanilla and mix until smooth. Add more powdered sugar or a splash of milk, if needed, until desired consistency is reached. Once the cookies have cooled, add a small spoonful of cream cheese filling onto one cookie. Place another cookie on top and press them together to make a cookie sandwich. We love traditional sandwich cooke and I thought we would give these a try for Valentines day. They were a huge hit! Thanks so much! Thanks so much for the recipe. I made them for a party and they where scrumptious! Haven’t made them yet, but they do look good, but don’t like the idea of using red food color! Can it be left out, and what would you use in the place of that? They kinda look like oatmeal pies and I love those…..